back to the battle ground." a frozen emotional ice age." It was just after 10pm before needle finally hit wax as the World Cup match between France and Uruguay was shown on the big screen outside before hand. 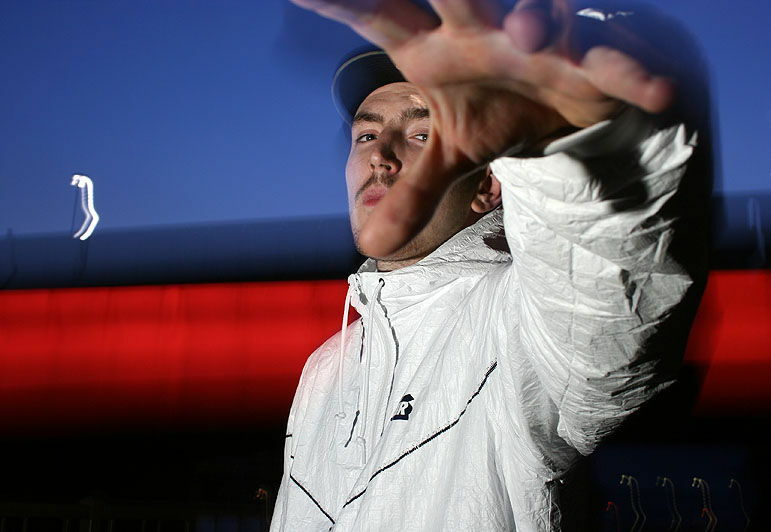 Kicking things of was Micall Parknsun - Previously part of North West London’s crew 2Halves with R.A.M. Now solo he got the ball rolling with Beatz and Rhymez and Holding It Down off his latest musical offering “First Second Time Around”. Micall Parknsun seemed to arrive late on the UK scene as I can never remember really listening to him during the golden era. Nevertheless, the dude is pretty sick and in my opinion underrated - but only slightly. People were feeling these live versions especially Come Again with rawkus shouts of "London City, London City" in place of the chorus we're more familiar with off the CD version. I haven't peeped the whole album yet but was certainly encouraged to do so following this little cameo appearance. Hats off Mr. Parknsun - you played a blinder! Parky’s album was released on the YNR label that Jehst set up while at university and the two feature on a lot of each other’s tracks which worked well with them both up on stage. The High Plains Drifter aka Billy Brimstone aka J-Star lept on stage for his verse on the track then the two of them launched into Who’s That off the Menghi Bus Mixtape. Jehst then went from the modern Menghi musings to Alcoholic Author – the classic track off The High Plains Drifter album and then onto the more melodic mash up joint People Under the Weather - that absolutely undeniable UK anthem that everyone can't help but sing along to! "There's about 10 people in this room but we're gonna make it feel like 10,000!" screeched the man like the j-star and for the next 3 mins with everyone singing along with their hands in the air it actually did. This track was backed up by Nuke Proof Suit off the Falling Down album. Its a classic track, we love it and you should definitely check out the video on youtube - a blatant piss take out of 50 cents Bullet Proof Vest. Wicked how British sarcastic humour made its way into to a sickly constructed and colorfully worded couple of verses - nothing but dope! Why, for the love of god, did he not BLOW UP following that track? Jehst is one of all time favourite rappers. Although many others from TheRapBuzz.com collective will beg to differ, there are very few other english language rappers out there who can touch him lyrically. Jehst has got that easy going, listenable voice, characteristic style and the most incredibly layered and intelligent wordplay that more often than not is beyond all comprehension with his verses all so carefully and thoroughly crafted in such an overwhelming artisanal fashion. That's just the thing with Jehst - his voice, wordplay, content and delivery are all instantly recognisable. That being said, it is exactly this that is his downfall when it comes to live performances. TheRapBuzz.com has seen Jehst do shows in Bristol, Bath, Cardiff and several times in London both headlining as well as providing support for some of the more established names from the global scene e.g. Raekwon at Matter last year. Every time we see him on stage we can't help but feel disappointed. The thing is - his style just doesn't translate well live. The power and weight his rhymes carry come from the cleverness of his wordplay and the vivid pictures painted by his content. Stick him on a stage jumping around trying get people hyped doesn't enable him to properly give us what we expect from listening to him on CD though. Part of this has to be put down to the fact that in the UK, the majority of venues where this sort of music happens, the sound systems are always of pretty poor quality - or maybe it's just that we've been spoilt by seeing shows in France where live performances are always delivered thru’ systems with crystal clear audible clarity. Even where you'd expect the sound systems to be a little better (Jazz Cafe, Matter @ O2) we're still faced with the same problem - we can't hear what makes him good. Not that it's much of a problem, every one of the 10 people present knew all the words just as well as he did. But this could be part of the reason why nothing more ever came from the talent that would/could/should have made him more of a household name perhaps not just in the UK. We were saying before the show how the only way for him to show off this very talent well enough live would be if we were chilling on someone's living room sofa with him stood right in front of us rapping. Funnily enough, this is exactly the set-up at the upstairs of the Vibe Bar, a lounge size room with a few sofas right in front of the slightly raised stage with just enough space in between for a few dozen people. Just a shame that only about 10 people turned up to fill it. Jehst is a UK veteran and has appeared on practically all the best tracks ever to come out of the British Isles just take Cosmic Gypsies or Riviera Hustle as proof. Pure sickness, and this is why he has spawned a million soundalikes in Britain. His contribution to rap music in this country is undeniable - there are a $hit load of rappers out there who we never would have heard of, who never would have been able to express themselves musically to as many people as they do without Jehst. Though we are often left a bit bamboozled at some of the collaborations and the people he picks for his label, you can't deny that Jehst has intentionally, purposefully and almost single-handedly been responsible for an awful lot of output over the years; and it's fair to say that the scene in the UK probably wouldnt be where it is today without him.